In case it wasn’t already crystal clear to you….This sign won’t save you. Yesterday in Chattanooga there was a piece of glass full of bullet holes. On one side of that glass was a terrorist, firing bullet after bullet into a military recruiting office. It was a military recruiting office in a shopping center, on a busy Thursday morning, full of regular people just like you and me. On the other side of that glass were brave men who had sworn an oath to defend our country against terrorists like the man outside. Brave men who were specifically trained to deal with the terrorist outside, but were unable to. Those brave men had devoted their lives to defending the defenseless, but at that very moment had become the defenseless themselves. Why? Why were those brave military men defenseless? Why were the people best trained to deal with a terrorist so helpless? Why? Because the good guys didn’t have a gun. This is a picture of the front of that recruiting office. Look at it very closely. 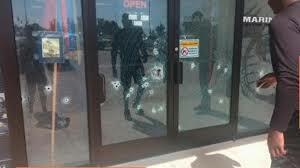 That sticker on the door indicates that guns aren’t allowed in that building. Well again, a bad person has proven that no matter what kind of laws we pass and no matter what kind of signs we hang and no matter what great lengths we go to in an effort to declare a place “safe”….Bad people will find a way to do bad things. The terrorist went on to kill four people and seriously wound another. What stopped him? It wasn’t the sign that prohibited concealed weapons in the office. It wasn’t the security fence that he drove through or the barricades that he drove around. The bad guy with a gun was stopped by a good guy with a gun. America, every time the government wants to pass a new law that restricts your ability to protect yourself with a gun I want you to remember this picture. Because no matter how many laws are passed and no matter how many signs we hang up prohibiting bad things from happening….Bad people will do bad things. And the absolute best, and only, thing that will stop a bad guy with a gun….Is a good guy with a gun. Yesterday proved that signs don’t work. Signs turn heroes into victims. Don’t be a victim, America. ← I completely agree with Obama’s foreign policy….